Apparently I’m all about the butternut squash this week! To be fair, it was somewhat on purpose. I feel like by now all of you, my dear readers, might be feeling a little overwhelmed with all the pumpkin recipes currently populating the web and social media. I also feel that butternut squash is a delicious yet often overlooked fall ingredient and I wanted to be sure to give it its fair share of attention before we go too far down the pumpkin recipe rabbit hole. 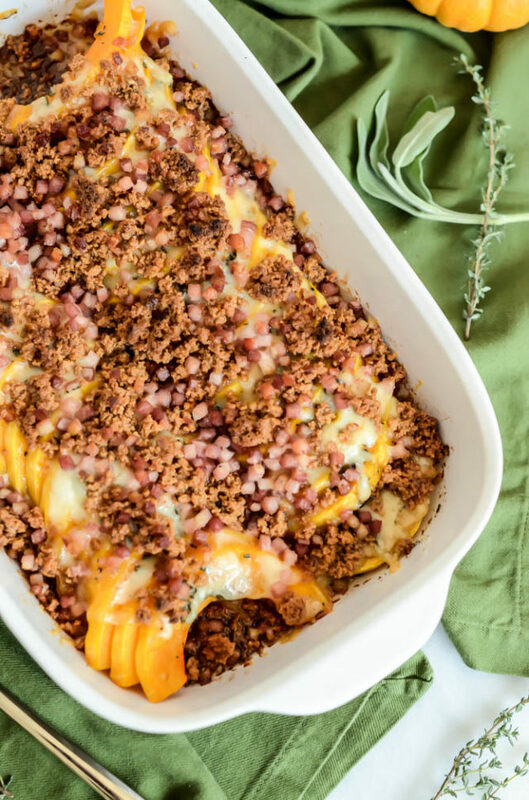 Enter this Herbed Butternut Squash Gratin with Amaretti Crumble! I realize I haven’t posted a ton of vegetable side dish recipes on the site, and I honestly can’t tell you why. Maybe it’s because I like to incorporate as many vegetables as possible into my main dishes, or maybe it’s because often our “vegetables” are prepared simply and easily without a lot of flourish. 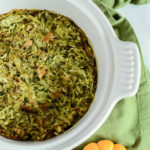 But every once in a while I think we can all agree it’s nice to have a fancy veggie side dish to contribute to a get-together or family dinner, especially during the holidays when group gatherings are in full force. 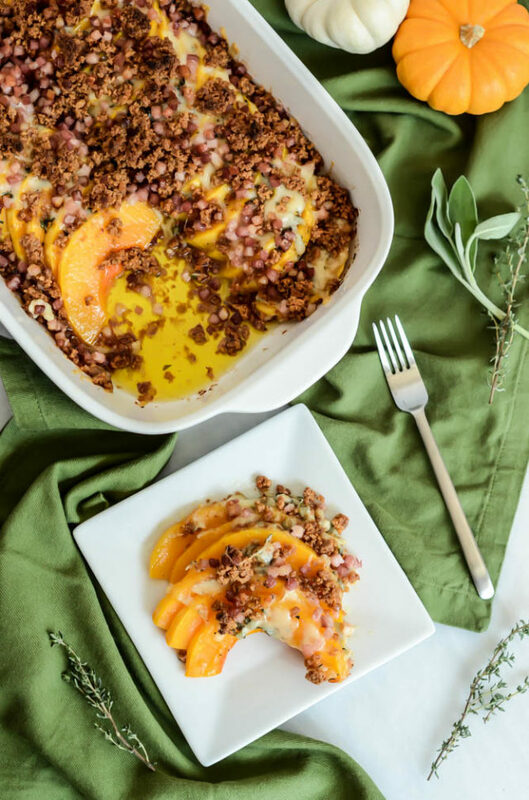 And let me tell you – this Herbed Butternut Squash Gratin with Amaretti Crumble is seriously one for the books. I mean, anytime you combine a super-healthy vegetable, tons of fresh herbs, crunchy amaretti crumbles, pancetta and CHEESE, I call it a surefire winner. 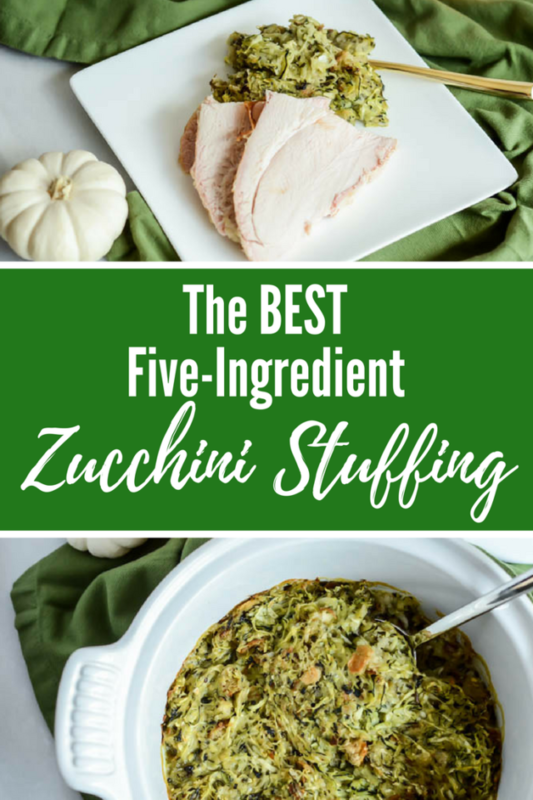 I may have come up with this recipe in the middle of September when it was still blazing hot out, but I sure as heck haven’t stopped making it since and plan to continue to make it whenever our little babe allows me the time to get in the kitchen and cook. 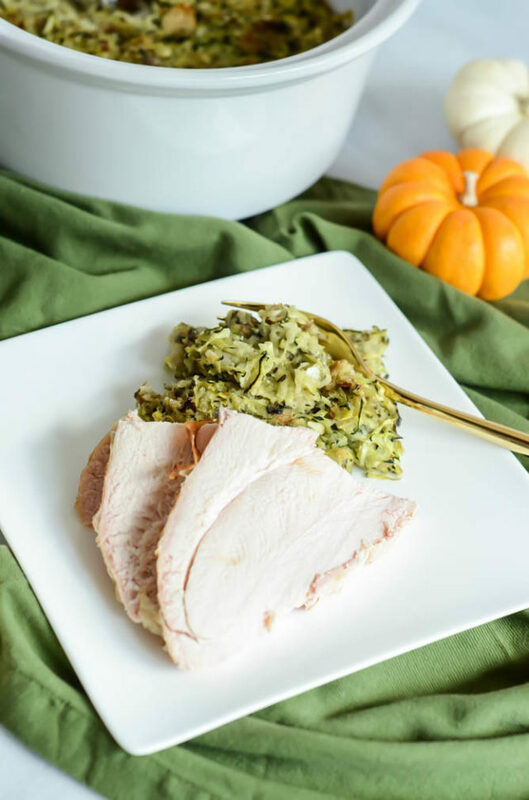 I may also subtly share the recipe with my family so they can make it for Thanksgiving and/or Christmas. I mean, it would only be appropriate, right? 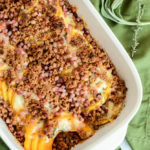 I’m also going to go out on a limb and guess that said Herbed Butternut Squash Gratin with Amaretti Crumble is going to please even the pickiest of little eaters. 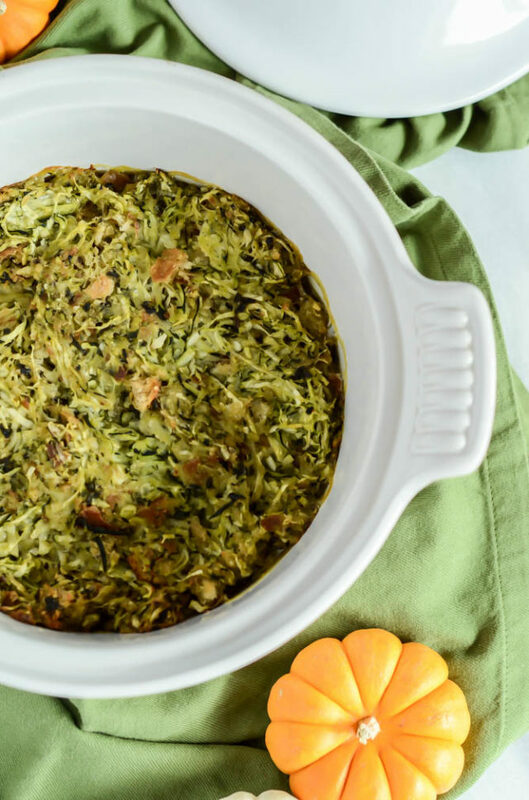 After all, what kid doesn’t want a nutrient-filled side dish that also happens to include CHEESE and COOKIES and taste out-of-this-world? I dare you to give it a shot. 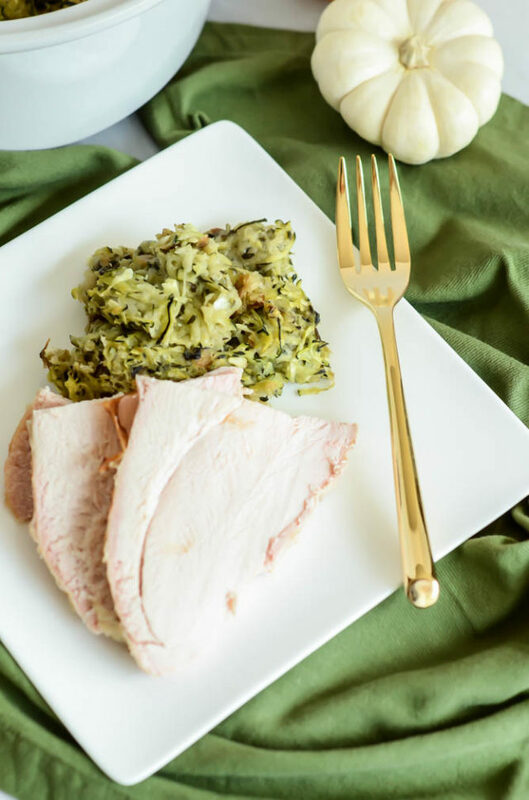 The great thing about this holiday-appropriate recipe is that it’s very much a “set it and forget it” recipe, meaning you prep everything in a baking dish, pop it in the oven and forget about it until it’s ready to eat. So sure, you may need to coordinate the oven time with other important holiday things – like turkey! – but once it has it’s moment, it’ll be ready to shine along with everything else gracing your feasted table. 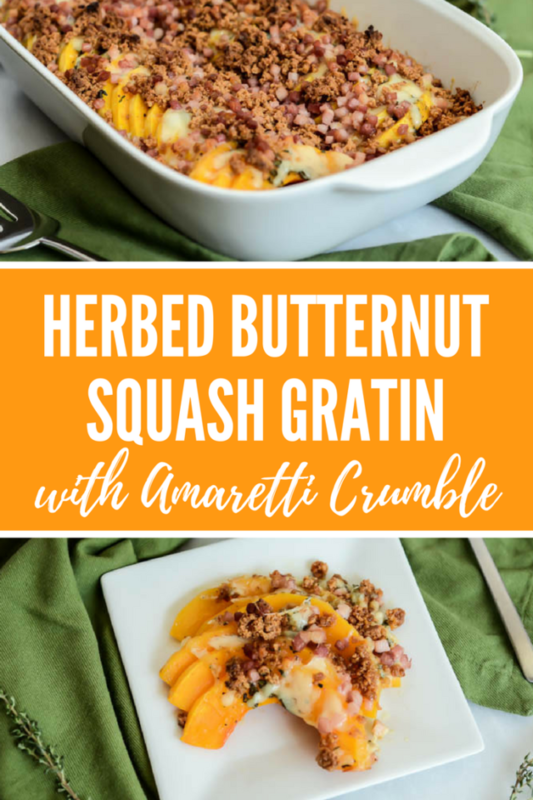 I don’t have too much else to say about this Herbed Butternut Squash Gratin with Amaretti Crumble, except that you really need to make it ASAP, even if it’s just for a trial run before the big day when you plan to wow all your family and friends. I guarantee it’s going to be a huge hit! 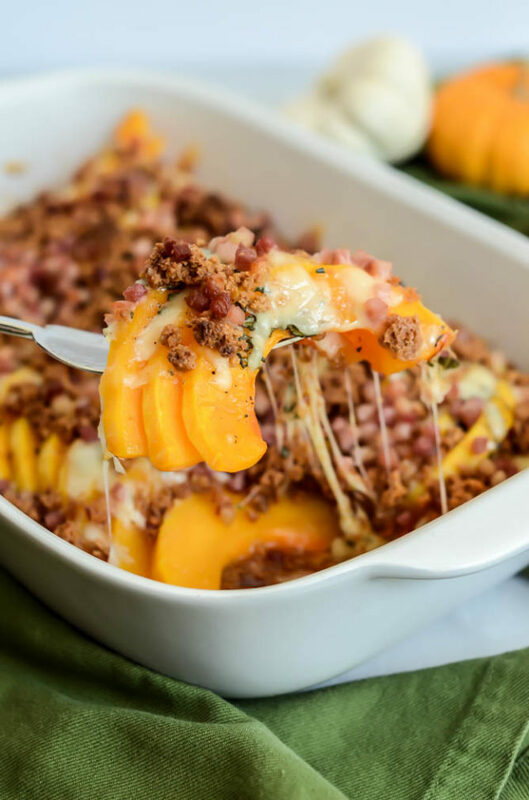 This butternut squash side dish is full of flavor with fresh herbs, Gruyere cheese and crispy prosciutto. Perfect for the holidays! Place butternut squash slices neatly in a rectangular baking pan, drizzle on olive oil and season with salt and pepper. Follow by sprinkling on the thyme, sage and grated Gruyere. Combine the amaretti cookies, softened butter and orange zest in a food processor and pulse until a crumble forms. Sprinkle the crumble over the squash and then sprinkle on the pancetta. Place pan in oven and bake at 375 degrees for 30-40 minutes. 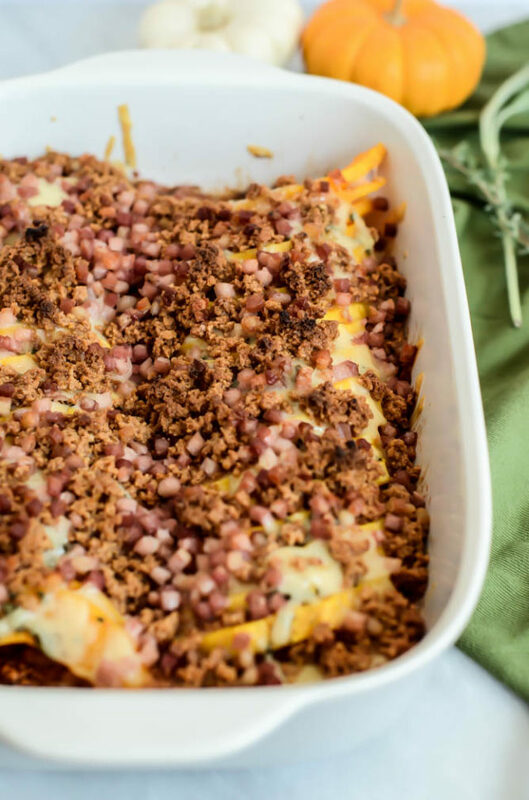 Then increase the oven temperature to 425 degrees Fahrenheit and bake an additional 5-10 minutes longer, or until butternut squash feels tender when pierced with a fork and pancetta is slightly crispy/bubbly. Let cool slightly before serving. It’s hard to believe something so simple can be so delicious. 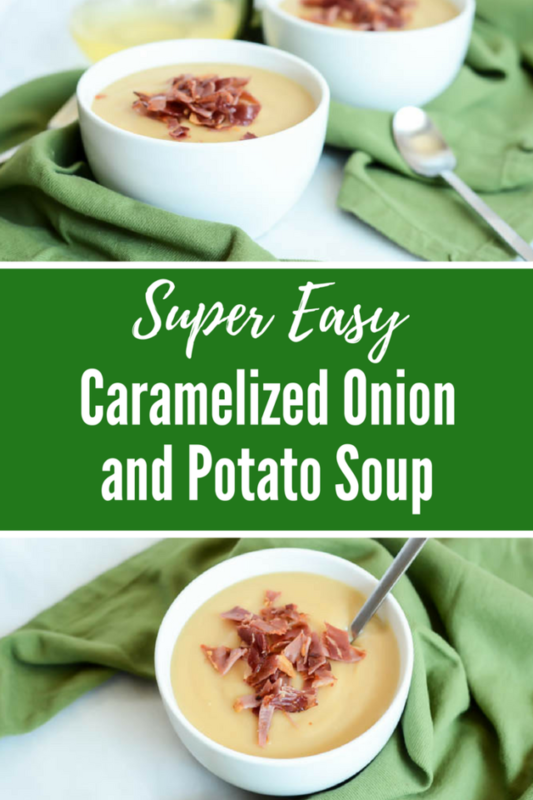 This Super Easy Caramelized Onion and Potato Soup is the perfect example of how just a few ingredients can turn into something completely magical. We’re talking creamy mouthfeel, layers of flavor and in fact a pretty darn healthy meal. Once you taste it, your life just may be changed forever. The restaurant also happens to be one of my husband’s work accounts, so we often find ourselves eating there both for lunch during the week and quite frequently on a “date night” out on the town. What can I say, when we find something good, we stick with it. Anyhow, even though alllll of the food is delicious, one of my favorite things to order at lunch (okay, even often at dinner) is a cup of their soup of the day. It changes frequently, and you’ll rarely get the same thing twice, but it’s always tasty and I’ve never been disappointed. A while back, I met Chris there for lunch and they were serving a Caramelized Onion and Potato Soup. I wasn’t too sure what to expect (for some reason I thought it might be chunky?) but I went ahead and ordered it because I knew I wouldn’t be disappointed. What came out of the kitchen was a delicious, velvety smooth purée that was chock full of flavor and left me practically licking the bowl. I immediately knew I wanted to recreate something like it in my own kitchen! And that’s what you have here today folks, what I’m proud to say is almost a spot-on rendition of the soup I tasted on that fateful day. I made this Super Easy Caramelized Onion and Potato Soup all from taste, without asking the chef for any tips on how they did it, but I’d have to say I’m really darn proud of the result. The best part about this recipe? It only requires 6 ingredients (well, 8 counting the optional one and salt and pepper) and comes together easily and beautifully as long as you (a) have the patience to caramelize some onions beforehand and (b) have a regular or immersion blender on hand. I mean, I found myself standing at the stove asking “Is this really all I need? Is the flavor really already this outstanding?” Yep yep, they are! Plus a little salt and pepper. That’s it! 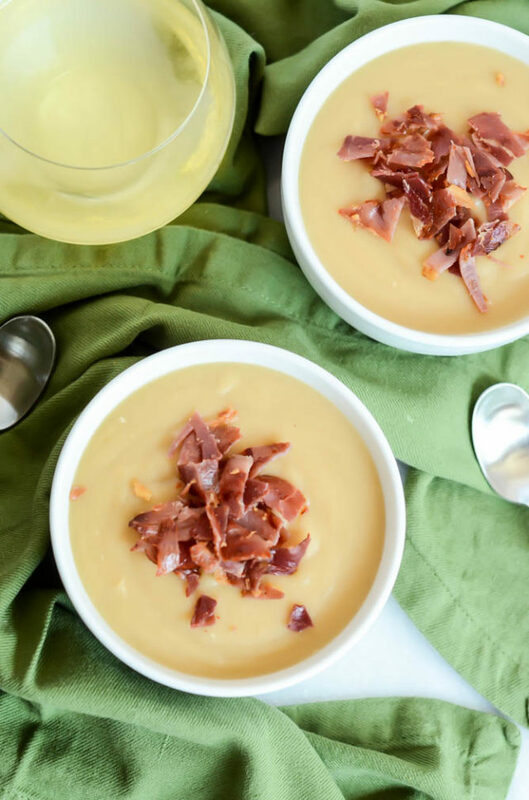 I’m venturing to guess you may already have a lot (if not all) of this stuff on hand, which means Super Easy Caramelized Onion and Potato Soup is becoming even more of a reality for gracing your dinner table tonight. Although this recipe is easy and does not require much hands-on work, it does take a little bit of time. We have to give all of those delicious flavors time to come together, after all! But the results are totally worth it. Promise. 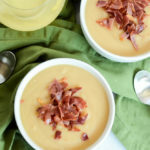 Do you have any fun and delicious soup recipes I need to try? Now that fall is just around the corner (and Baby D’s due date!) I’m looking for all the cooler weather recipes I can get my hands on. Leave me your recs in the comments below! 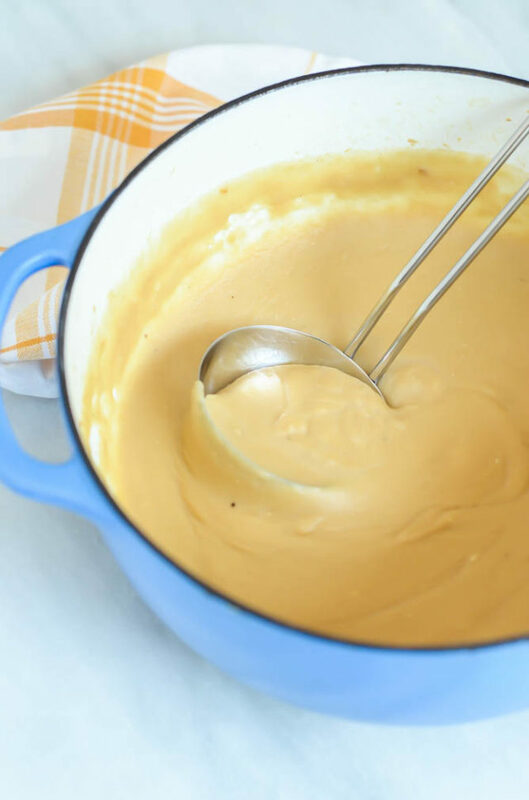 A creamy, velvety soup full of hearty potatoes and flavorful caramelized onion. 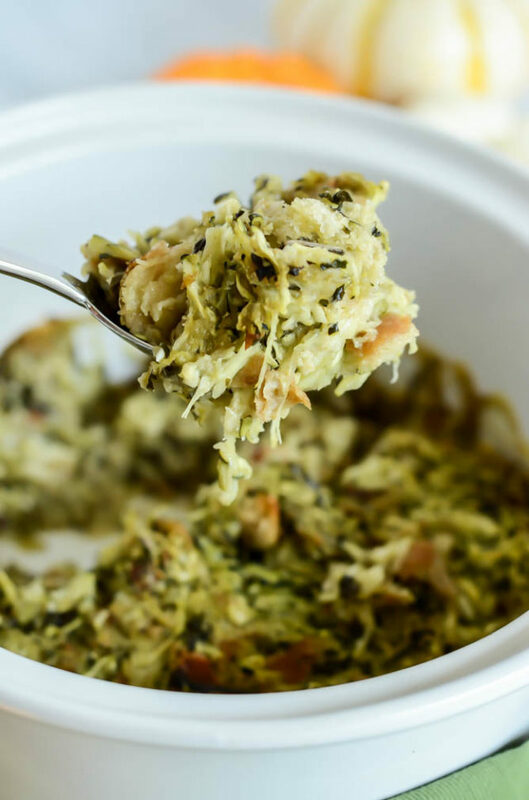 The perfect, easy comfort food meal for cooler weather! First, you’ll want to caramelize your onions. Melt butter in a sauté pan over medium-low heat. Add sliced onions and cook, low and slow and stirring occasionally, until onions take on that beautiful caramel color. This may take up to 30 minutes. Be patient! You don’t want to cook the onions too fast and give them a burnt flavor. Once onions are sufficiently caramelized, add them to a large stockpot along with potatoes, chicken stock and peeled, whole garlic cloves. Bring to a boil, then reduce to medium heat and simmer until potatoes are tender when you poke them with a fork. Reduce heat to low. Use either an immersion blender or transfer the soup to a regular blender and purée until there are no longer any chunks. Transfer back to the stockpot on low heat (if using a regular blender), stir in heavy cream (if using) and season with salt and pepper to taste. 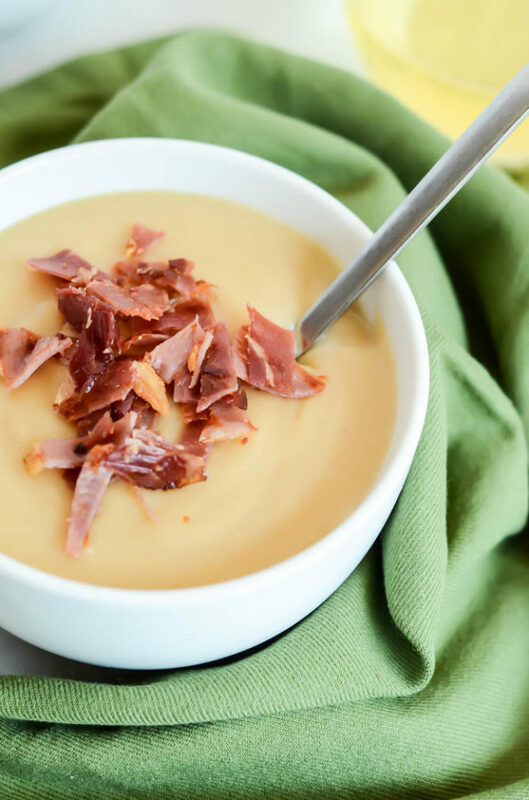 Keep soup simmering on low while you make some crispy prosciutto to top it off! Heat a small nonstick sauté pan over medium-high heat. Once pan is hot, add slices of prosciutto and cook until crisp, flipping when necessary. Transfer to a cutting board and chop prosciutto into little pieces. 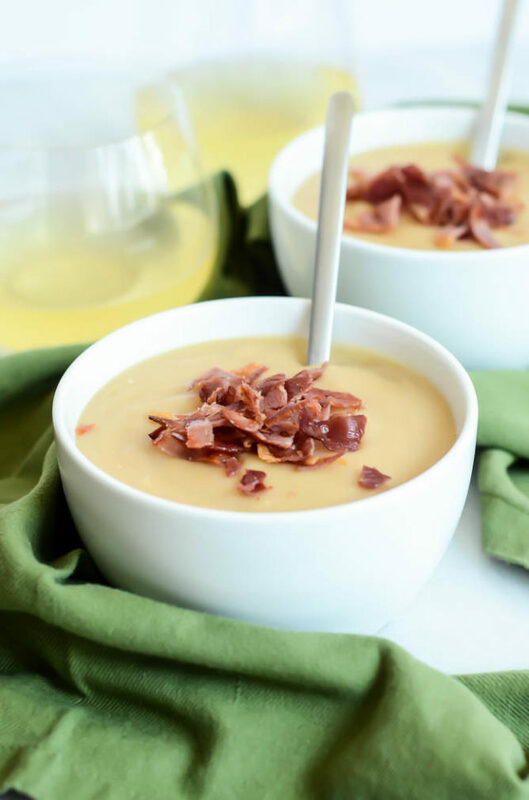 Ladle warm soup into bowls and top with crispy prosciutto. Enjoy immediately! A classic French cheese and charcuterie accompaniment gets a healthy, vegetarian makeover when made with fresh mushrooms and thyme. Who’s ready for a little decadence? Meeeee!! We all know that the very beginning of the week is THE worst, so I always try to do a little something special/out of the ordinary to make it seem just a little less, well, depressing. 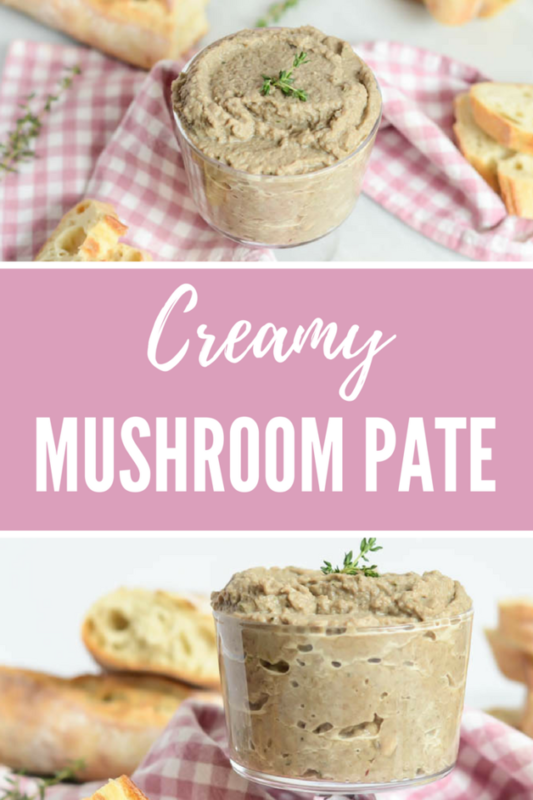 This Creamy Mushroom Pâté is my answer to that this week, and I hope you enjoy it as much as we have. First off, tell me, have you ever had pâté? If not, you’ve really been missing out. 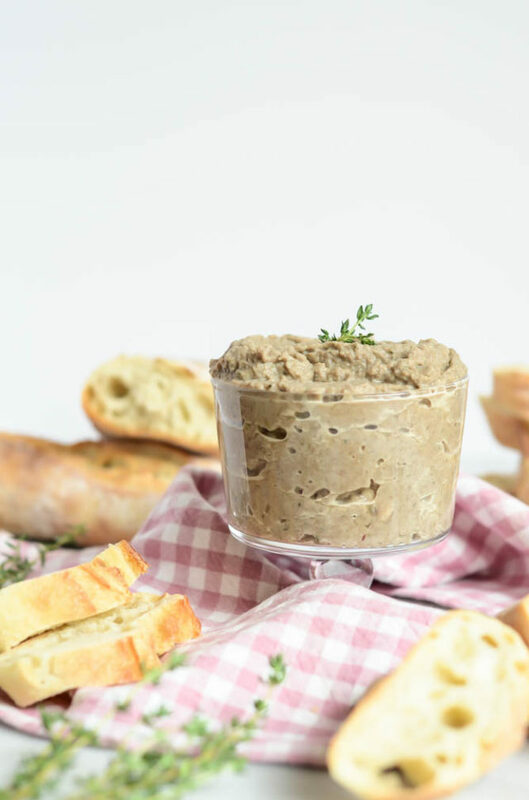 It’s typically made from chicken liver (don’t gag just yet, trust me, I hate “liver” but I love pâté) but it can also be made from any number of things such as beef, pork, ham, seafood and VEGETABLES! Yes, vegetables. 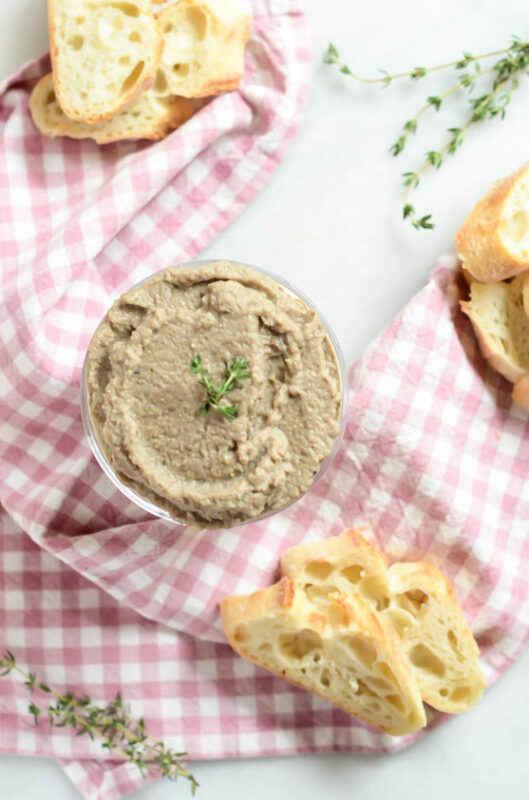 You’ll most often find it served alongside a cheese platter and/or plate of charcuterie, and you know these are some of my favorite things, so it’s no surprise that I’ve decided to make my own, healthier version of pâté to share with all of you! 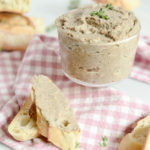 So here’s what you need to do to have a bowl of Creamy Mushroom Pâté in front of you in no time: You’ll first need to sauté the mushrooms in olive oil with some shallots, garlic, fresh thyme and marsala. Then, once those ingredients are nice and cooked, you’ll transfer them to a food processor to get that creaminess going. Finally, you’ll throw in the butter (while the mixture is still warm) to really seal the deal. 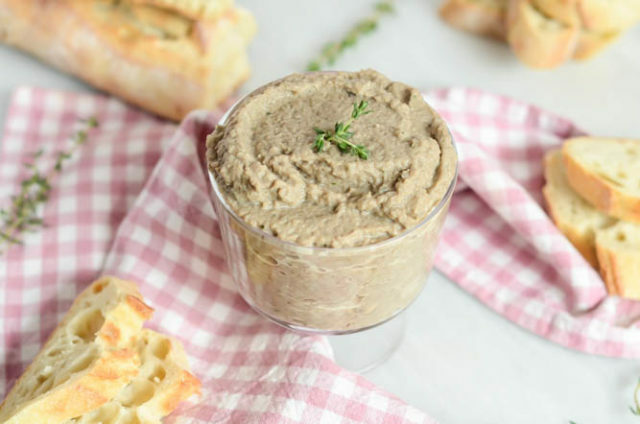 My best suggestion for serving is to serve as you would any other pâté – with a fresh baguette, some crackers, and perhaps a nice chunk of cheese or two. Oh, and wine! Please don’t forget the wine – and have a glass for me? Warm olive oil in a large sauté pan over medium heat. Add sliced mushrooms, shallots and garlic and stir to combine, cooking until mushrooms begin to sweat. Add fresh thyme and marsala and stir to combine. Let cook until mushrooms are nice and sautéed, about 5-7 minutes. Add salt and pepper and stir again to combine. Transfer mixture to the bowl of a food processor and pulse until a rough purée forms. Cut butter into three separate tablespoons and add to the food processor. Pulse until a creamy (not chunky) purée forms, season with more salt and pepper, if needed. 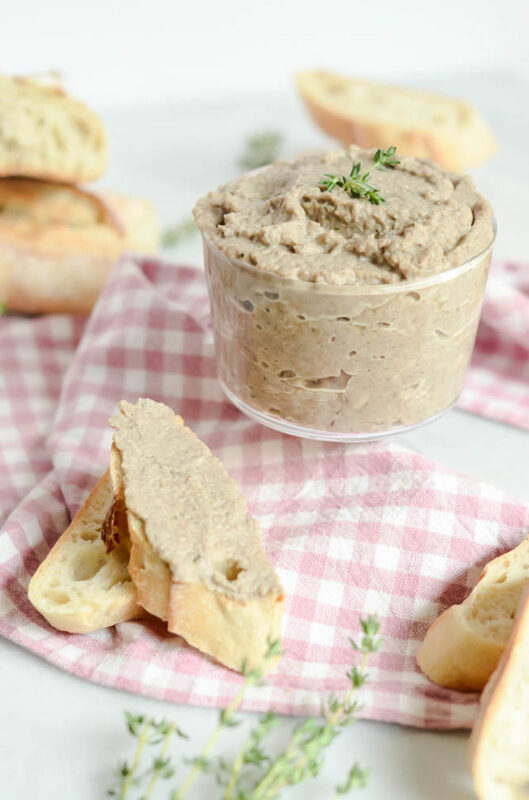 Transfer to a bowl and serve with baguette, crackers and cheese. At least I have one good reason to get up this morning! And that’s to enjoy this uber-delicious Fresh Fig and Burrata Salad with Toasted Hazelnuts for lunch. After the morning I’m having, I’m going to need it! Right at this moment I’m sitting in the waiting room at the doctor’s office having just guzzled down a disgustingly sweet “Gluco-Crush” (no joke, that’s what it was called) for my gestational diabetes test. I now have a cloying after-taste in my mouth and all I can think about is all of the REAL food I’m going to eat after my hour-long wait for a blood test is done. Oh, the joys of pregnancy! Speaking of, I know I’ve kept it mostly food here on the blog throughout my pregnancy so far, but do you have any interest in me doing some posts on my pregnancy? I always think I need to just jump in an do it but then I get worried that y’all will hate me if you’re not pregnant and I’m not posting delicious food recipes all the time. Thoughts? Requests? I’m all ears! I’m definitely thinking I’ll start to do some food prep recipe posts in the next couple of months, as I’m starting to think about having our freezer stocked full of delicious things for when the baby comes so we don’t have to worry so much about cooking and just enjoy the time with our new little one. If you have anything in particular you’d like me to make, or any suggestions of stuff YOU’VE made that was a lifesaver, I’m all ears! 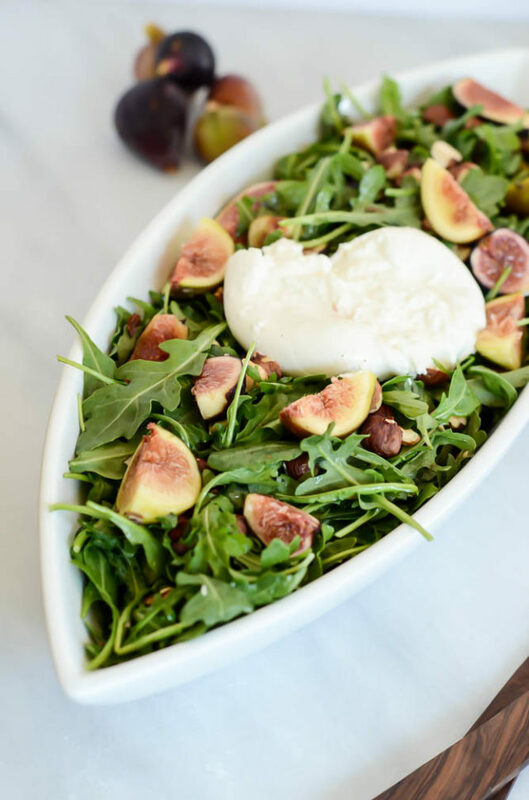 Okay, but back to this Fresh Fig and Burrata Salad with Toasted Hazelnuts. I hope you all are as obsessed with fresh figs as I am, because you can bet I’ll be using them in as many recipes as possible if/when I can find them. I was able to find these ones at our Farmer’s Market (there were just TWO vendors selling them!) but our Trader Joe’s had them for a hot second a month or so ago and then when I went back they had disappeared already. I’m hoping we’re just at the start of the season and they’ll become more widely available in the next month or so, otherwise I totally missed the boat on all the fig recipes I want to make! So, I found my fresh figs and I even bought two different varieties because I couldn’t decide which one I wanted, but feel free to use any variety you like. 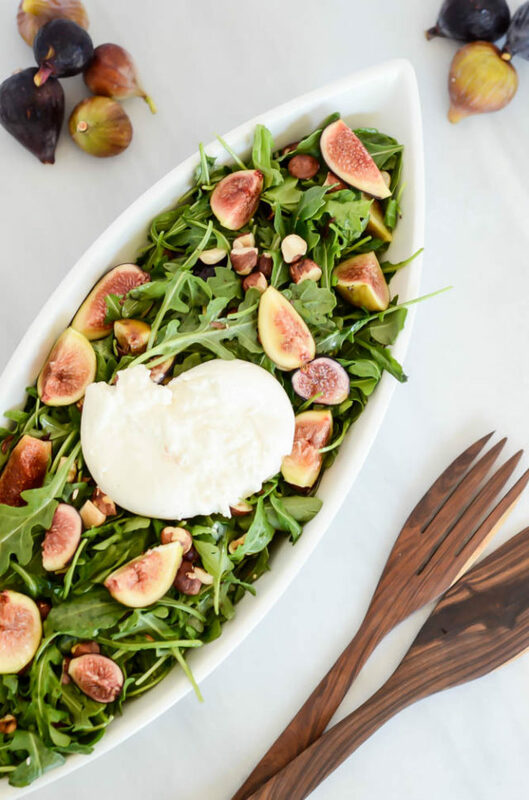 Aside from the figs, all of the ingredients for this salad are pretty darn #basic, and TBH I even hesitate for a hot second about posting the recipe because it so like “duh” easy. But I brought it over to a friend’s house for dinner and it received such rave reviews that I knew I just had to post it. The only other ingredients you’ll need besides fresh figs are arugula, burrata, hazelnuts, olive oil and a nice, thick balsamic vinegar (I really like the Balsamic Glaze from Trader Joe’s.) Oh, and a pinch of salt and pepper! It’s amazing how often we forego seasoning our salads with good ol’ S&P here in the US, whereas in Europe it’s a regular thing. It makes such a huge difference! The other great thing about this recipe is there is absolutely no cooking involved. Which means it’s perfect for summer! Well, I do recommend that you toast the hazelnuts (toasting nuts adds a great dimension of flavor to any recipe) but that takes literally 5-10 minutes on the stovetop and you’re done. Nuts are also something you can batch-toast in advance and just keep on the ready in your pantry for whenever the mood for that extra pop of flavor in a recipe strikes. 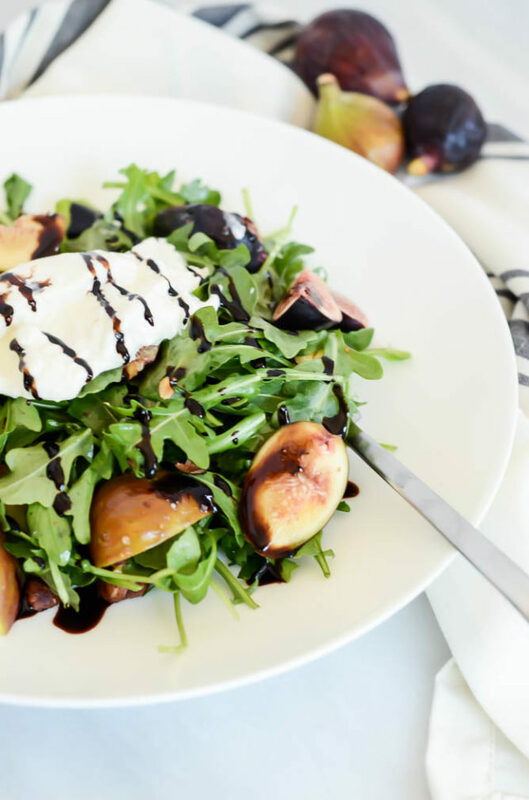 I tossed together the arugula, sliced fresh figs, toasted hazelnuts and salt and pepper with a light coating of olive oil, then drizzled on the balsamic glaze and plopped that creamy, cheesy goodness that is burrata right on top. I kept the burrata whole for transporting to my friend’s house, then cut into it and let it ooze all over the individual portions as I served. I also brought along extra olive oil and balsamic just in case people wanted some extra dressing. That’s it! Pretty easy, right? 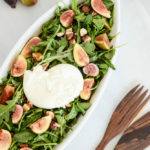 The fact that it’s no-cook and showcases some of the season’s best produce makes this Fresh Fig and Burrata Salad with Toasted Hazelnuts a real winner in my book, especially for this time of year. 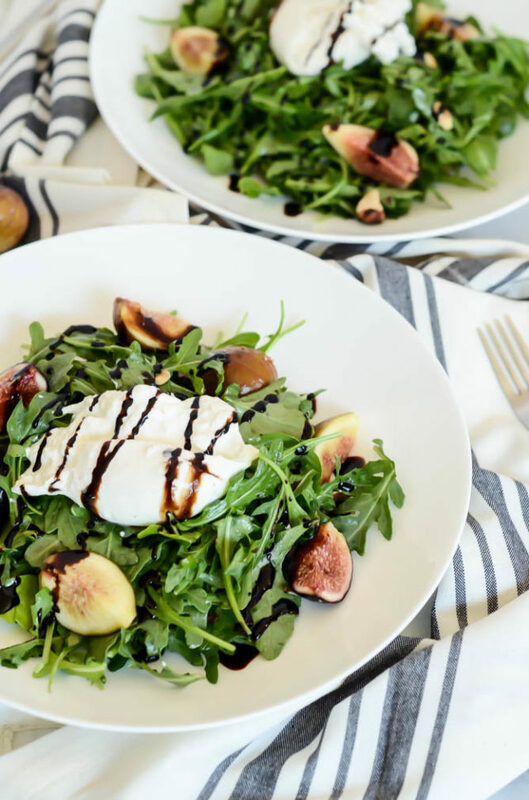 This summer-y salad features fresh figs, arugula and toasted hazelnuts, all topped with creamy burrata cheese and an easy olive oil and balsamic dressing. In a large bowl, toss together the arugula, fresh figs, hazelnuts and olive oil. Season with salt and pepper to taste. Drizzle on balsamic glaze and top with burrata. Cut into the burrata when you’re ready to serve!